DaliART Mehndi Bird Song Stamp inspired by henna designs. Being tear resistant, the stamp is tough and can be stretched and will relax back to their original shape. It has an excellent back adhesion, allowing repositioning many times on an acrylic block. 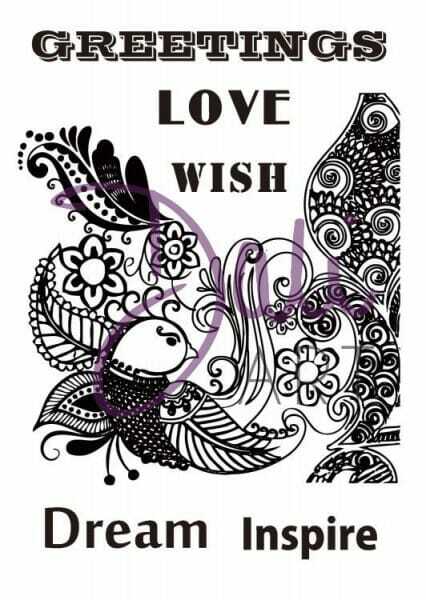 The Mehndi Bird Song Stamp will work excellently with all water-based or solvent based inks. You will require an acrylic block with this stamp, which is not included. Customer evaluation for "DaliArt - DaliART Clear Stamp Mehndi Bird song"